I have sent a private message for your address, once I receive a response I will contact Quiltmaker to send your magazine. Thanks to everyone for commenting! If you would like to purchase a copy you can visit this link to quiltmaker's quilt and sew shop. Yippee!! 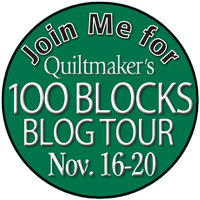 This is my very first time in the Quiltmaker's 100 Blocks Blog Tour. The magazine hits newsstands today! I love 100 Block's magazine. I think I have them all LOL. Having 100 designs in each issue, there is definitely something for everyone. 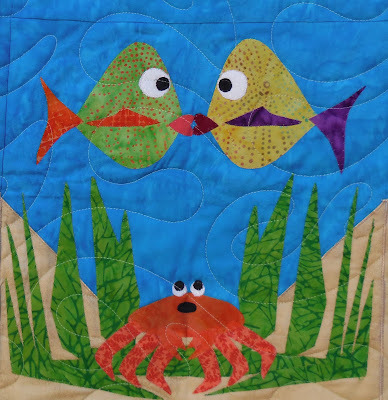 Every technique you can think of and something for every level of quilter. 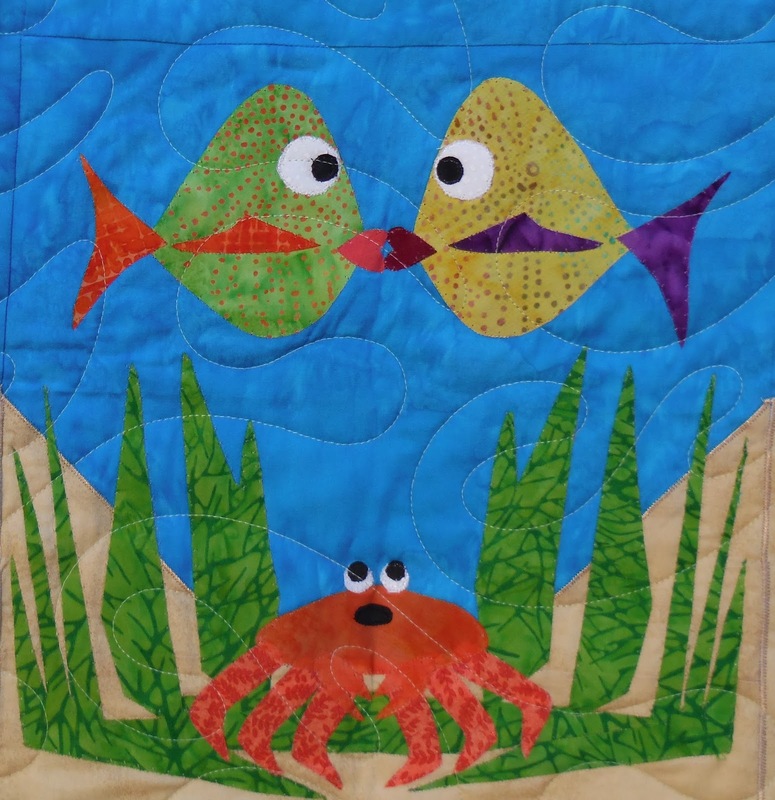 I have been quilting for about 4 years. As my blog name states, I am a little crazy. I have all kinds of crazy ideas "swimming" around in my head. I received EQ7 as a gift from my husband and I was playing around with different shapes and all of a sudden one looked like a fish to me. So, I got a crazy idea to have two fishies kissing. 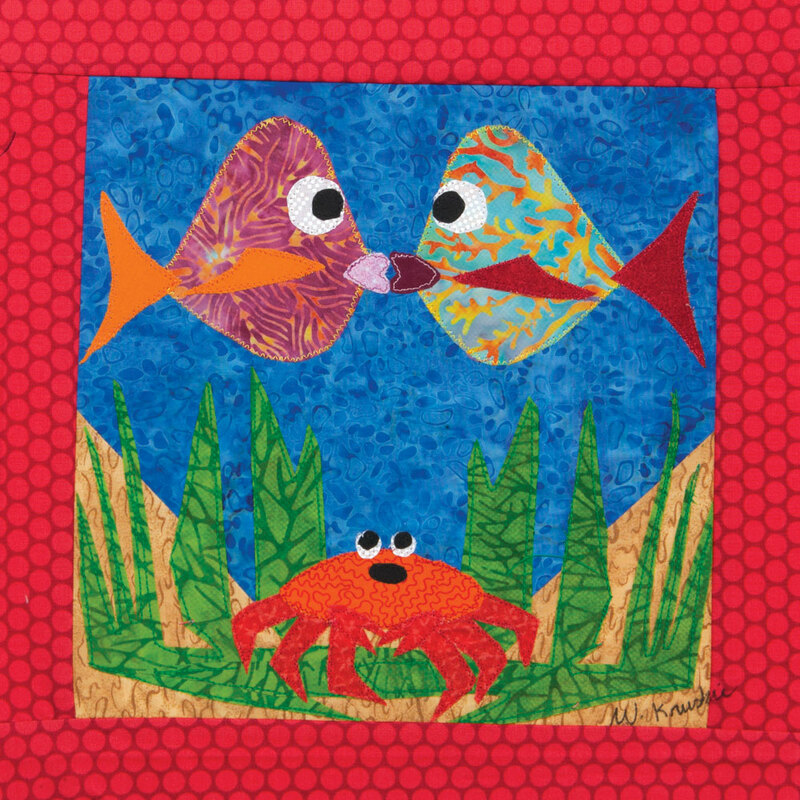 Then I thought, Hey what about a crab looking up at the smooching couple. So, here is is my block design. You can find it on page 31, block #1148. 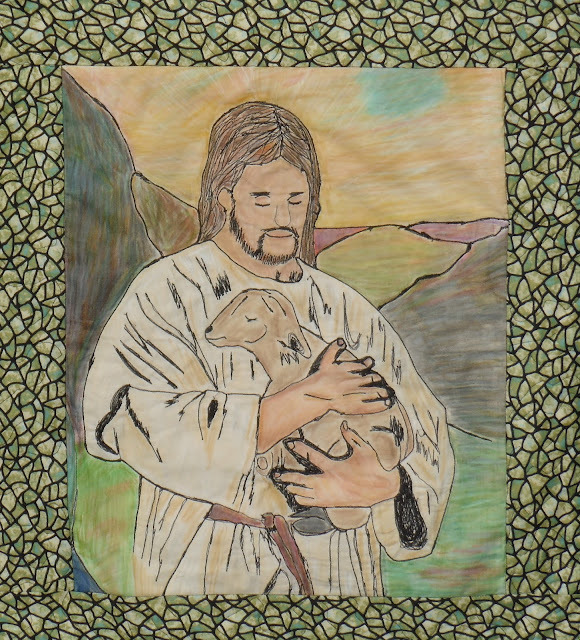 Thank You Quiltmaker for allowing me to share with everyone. Here it is again using different fabrics. You know I said before that I was crazy right? Well, check this out. I was trying to think of a quilt I could design from this fish block. I thought this block represents a big ocean with lots of sea creatures. Why not zoom out from the fish and see who else is watching the scene. 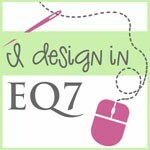 Here is the design in EQ7. Ha ha! It looks like we have a seahorse, jelly fish, clam, starfish, and lastly a bird dipping his head in for a view. Here is the finished quilt! The quilt is on page 78. The quilt was pieced by me and quilted by QuiltLizzy. Thank You for hopping by and if you would like, you can follow me. I need someone to talk to ha ha. Quiltmaker is the sponsor and they are giving away a free copy of this magazine. Shipping anywhere! In order for a chance to win just leave a comment below. I will randomly select a winner at the end of the hop. 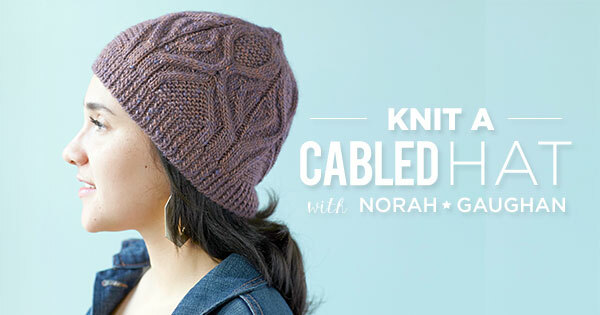 Check into the hop each day for more chances and to see other wonderful designs from other blogs. 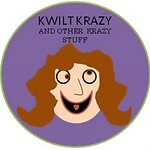 Have a Kwilt Krazy day!!! Christmas Is In My Heart! Giveaway Too!! Hi everyone! First let me give a big shout out to Marina at Seams to be Sew for once again coordinating all the fun. 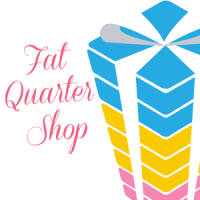 Thanks again to Fat Quarter Shop, they are giving away a $25.00 gift certificate each day of the hop. You can sign up for a chance to win at any blog that is showing the entry box. 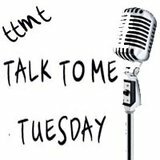 Just leave a comment at each blog for an entry. Be sure to check out Christmas is in My Heart blog hop every day. Well for me Jesus is the Reason for the Season. When I thought about the title Christmas is in your Heart, He was the first thing I thought of. I decided I would again do a thread art wall hanging. I searched for a picture to use from the internet and came up with this one. 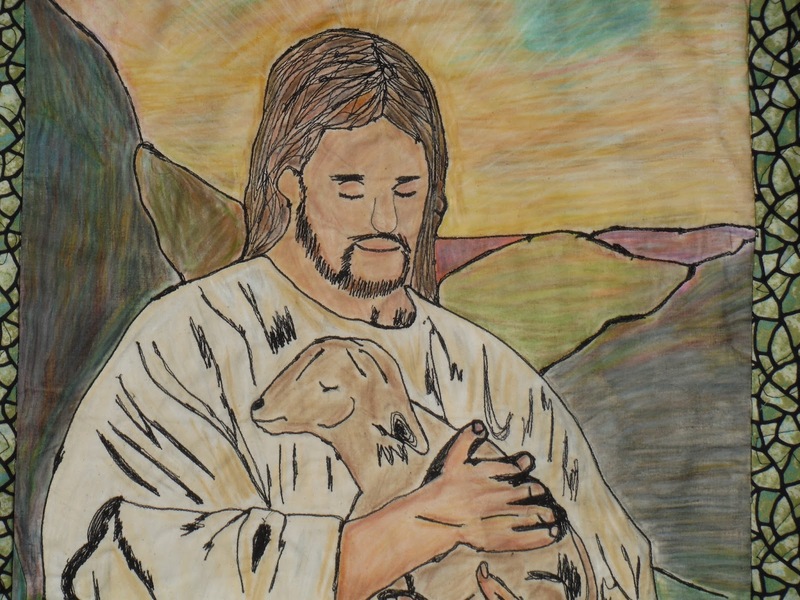 I saved the picture to my computer and then used a free online tool that will change pictures to sketches. Photo 2 Sketch You can upload any photo you would like to change to a sketch. I then blew up the picture and printed it off in 4 separate 8 1/2 x 11 pieces and taped them together to complete the larger size. I used a light box and #2 pencil to trace the major component lines onto muslin fabric. I am very happy with the way it turned out. I used black thread to free motion embroidery all of the details and then used colored pencils to add color. Finally, I used clear textile medium and a small paint brush and brushed the entire drawing, let it dry, and heat set with an iron. I had a fat quarter sitting around that always reminded me of stained glass. I thought it would be perfect for the border. Jesus has blessed me and my family so much. My days have not always been perfect. I have learned and will continue to learn when going through difficult times. 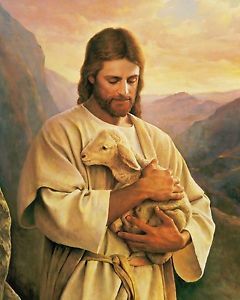 I am a cancer survivor and there are many other not so fun stories in my life but, I "know" He has always been by my side and even carried me through any hard times. Thank YOU Lord!!! I hope however you celebrate this time of year that you have a wonderful blessed holiday! Big HUGS to you all! Thanks to the Fat Quarter Shop "I" WON a $25.00 gift certificate during the Halloween Hop. Check out what I got :) Wha-hoo Downton Abbey Fat Quarters. The show is ending whaaaaaaa. Ok, now "YOU" could win a $25.00 gift certificate as well. Leave a comment below and hop on over to the other blogs for even more chances to win. All giveaways start at midnight est Rafflecopter Time and end at 11:59 pm est Rafflecopter Time. Don't forget to stop by all the other sites today! If interested come back tomorrow. 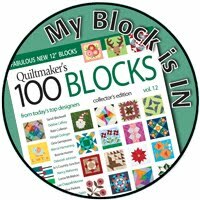 I have a block in Quiltmaker's 100 Block magazine and tomorrow is my day of that blog. 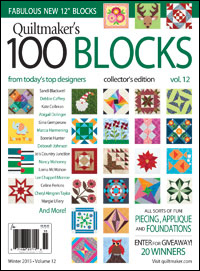 Quiltmaker will be giving away an issue of 100 Blocks from each blog participant.